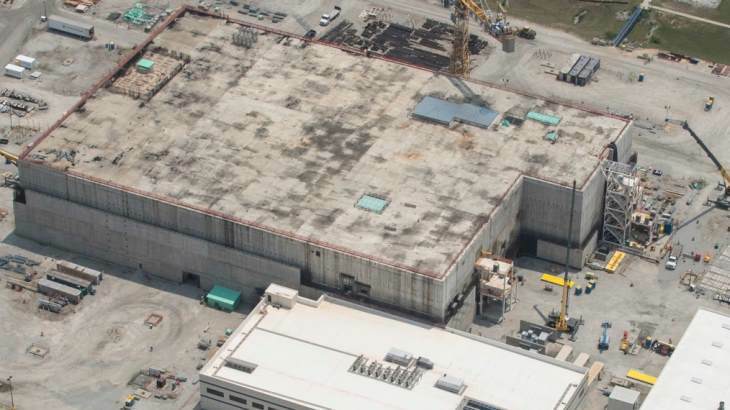 The National Nuclear Security Administration, a semi-autonomous agency of the US Department of Energy (DOE), has issued a contract termination notice to the consortium building the a mixed-oxide (MOX) fuel fabrication facility at the Savannah River Site in South Carolina. About 70% complete, the facility was intended to dispose of 34 tonnes of weapons-grade plutonium by turning it into fuel for commercial nuclear reactors. US Energy Secretary Rick Perry informed Congress in May that he had ended the project. NNSA said that it had delivered an official notice of contract termination to the MOX project's contractors and guarantors on 10 October. "This notice is a continuation of NNSA's actions following the certification submitted to the Congressional defence committees by the Secretary of Energy in May 2018 and the partial stop work order that began the contract termination process," NNSA said. "NNSA is committed to supporting the current workforce and will work with MOX Services throughout this transition process to reduce short-term impacts to workers, the surrounding community, and the State of South Carolina. There will continue to be a significant need for the talented workers at the Savannah River Site to support NNSA’s enduring nuclear security missions." On 18 October, US Senator Tim Scott made a statement after meeting with President Donald Trump about the MOX facility with Senator Lindsey Graham and Governor Henry McMaster. Scott said: "We wanted to make sure that we make very clear that keeping weapons grade plutonium in the Palmetto State is a non-starter. The bottom line is, we need to figure out how to make this energy either commercially viable or get it out of our state." He added: "The fact of the matter is we're looking for ways to keep the President engaged and not simply allow the Department of Energy to do what they have done in the past which is to use a set of numbers that we simply do not agree with." Work started on the MOX Fuel Fabrication Facility (MFFF) in 2007, with a 2016 start-up envisaged. Although based on France's Melox MOX facility, the US project has presented many first-of-a-kind challenges and in 2012 the US Government Accountability Office suggested it would likely not start up before 2019 and cost at least USD7.7 billion, far above original estimate of USD4.9 billion. The project has seen progressive cuts to its funding, with only USD320 million requested for the facility in the 2014 budget, reflecting a slowing down of construction and associated activities as the NNSA embarked on a review of its plutonium disposition strategy. The project was placed on cold standby after being effectively cut out of the DOE's Fiscal Year 2015 budget request. President Obama's Fiscal Year 2017 budget proposal, issued in February 2016, called for the termination of the MOX project. The US Nuclear Regulatory Commission signed an order on 13 November 2014 extending the completion deadline for the MFFF by ten years, to March 2025, at the request of its builder, Shaw Areva MOX services. It issued the original ten-year construction licence in March 2005.